Canadian delegate Cynthia Menard departed for Sanya China to compete at the 2017 Miss World pageant from Pearson International Airport, Wednesday 18th October 2017. Our nation’s delegate flew on China Southern Airlines where she was upgraded to First Class. That was an unexpected surprise and a blessing to be sure, as the airplane flew over the North Pole and the flight lasted thirteen and a half hours. 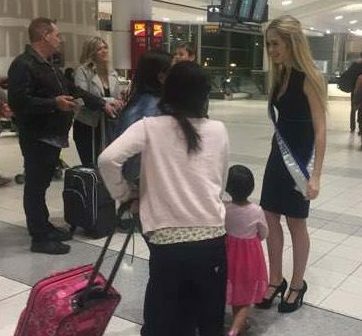 Cynthia Menard’s closest family and friends said goodbye to the fashion model, Miss World Canada 2017 at the airport on the evening of Wednesday October 18th as our delegate shipped her baggage full of fashion and beauty supplies to Sanya China where she will be competing in the 2017 Miss World competition. The Miss World competition is the longest running international beauty pageant on planet Earth. The pageant was first created in the United Kingdom by Eric Morley in 1951 and began life as a swimsuit competition to promote bikini style swimwear. For many years afterwards there was a Miss World Beach Beauty category as a ‘fast track’ stream inside the competition. This has been eliminated from the modern event, but a Best in Swimsuit category still exists. Today there are six ‘Fast Track’ streams by which delegates can advance to the semi-finals at Miss World. 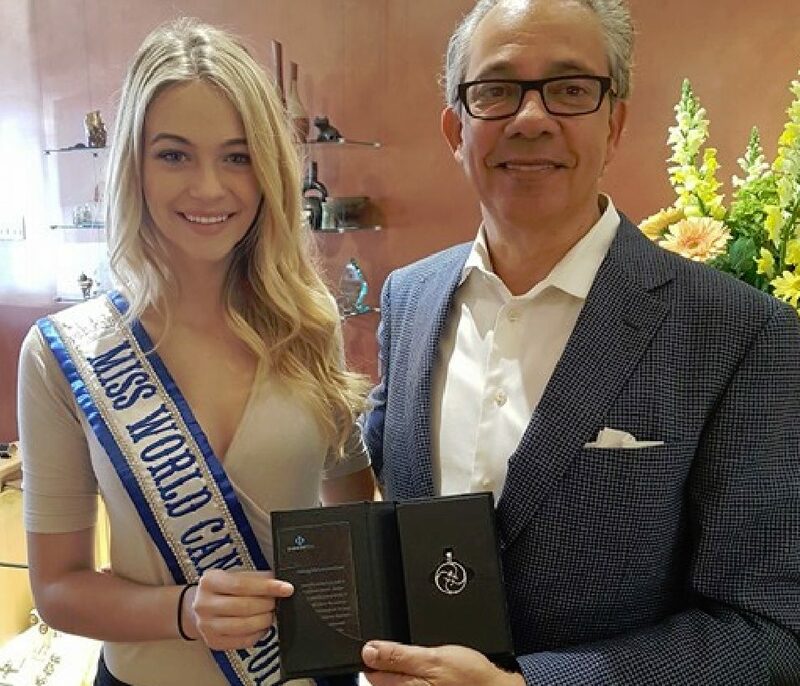 Cynthia Menard, Miss World Canada 2017 became a much better and more practiced singer after five intense voice training sessions and one-on-one singing lessons at the Wandering Minstrel Music School in Mississauga. The song is very powerful when performed live. Cynthia was easy to teach. She has a lovely personality and was very willing to learn and listen to suggestions. Singing is not as easy as everyone thinks. Anyone can sing, but it takes real skill to present and perform a story and convey the meaning of a song. Cynthia was enthusiastic from the beginning, and her confidence grew each week. Judy went on the explain how voice training and singing are two different things. Voice training will help Cynthia’s elocution (in both of Canada’s official languages) in all her public speaking roles as well as her live performances. Each of Cynthia’s singing lessons started with warm-up exercises that were tailored to her voice, and she also received detailed coaching on different techniques to improve her speaking and singing. The school’s goal was to get Canada’s best hope for a crown to be more consistent in her performance and be ready to own-the-stage. 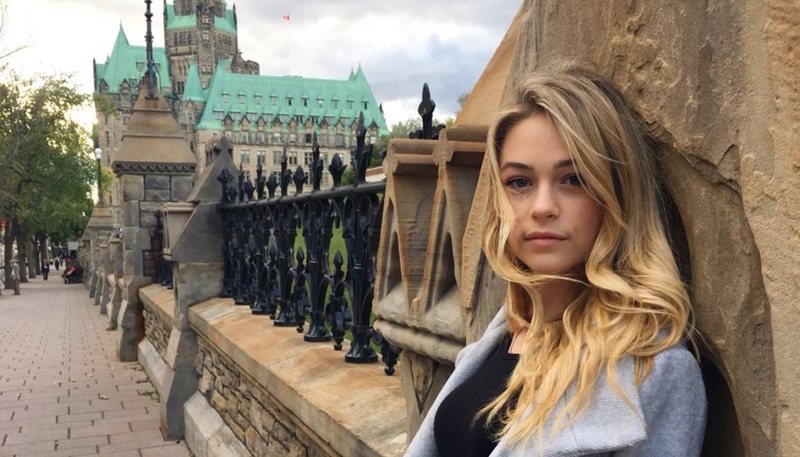 How can a seventeen-year old girl from Canada shine in this cut-throat competition when every country in the world is sending their most exceptional, most eloquent individual? The MTC-W strategy for their delegate is pretty straightforward. Cynthia stands out in photos and can sing her way to higher scores. Cynthia Menard got advanced teeth whitening in Toronto at Archer Dental as their contribution to our national presence. 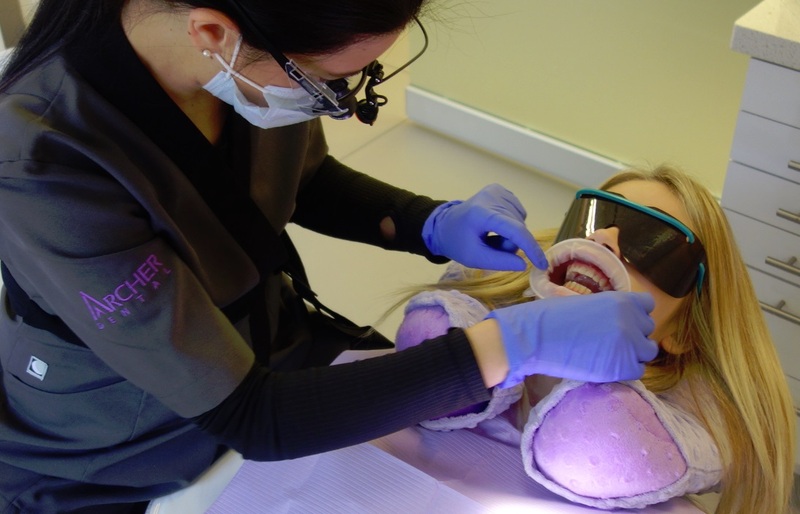 The Archer Dental blog about Cynthia’s teeth whitening detailed the delegate’s experience with the Venus Teeth Whitening system, both in-house photo activated peroxide whitening, and the take-home option involving custom-made plastic trays. Cynthia’s smile is even more dazzling after her trip to the dentist in Oct 2017. When photographers check their contact sheets after snapping pictures of all the delegates in China they’ll see the blond girl from Canada has a curious beauty and a fantastic smile. One of the half dozen suitcases that Cynthia checked into baggage must have been stuffed full of shoes, as NineWest shoes in Yorkville mall donated eight pieces of high fashion footwear for all occasions, and two evening clutches for Cynthia to wear as Miss Canada. Sketchers also donated shoes including sports shoes and Cynthia Instagramed a picture of herself wearing them on a golf course in China. Earlier in October 2017, Cynthia got some stunning jewellery at Fortunes Custom Jewellery Design Studio located at 1901 Avenue Road (just south of the 401) in Toronto, Ontario. As our “Miss Canada”, she will wear Fortune’s jewellery pieces to compliment her other Canadian designer fashions. Cynthia met the owner and founder of Fortune’s Jewellery; Michael daCosta is a renown Canadian jewellery designer and certified gemologist who started Fortunes in 1986, and now together with his son they’ve been servicing the Toronto area for over thirty years. Cynthia also met some of the Fortune’s Team, including goldsmiths, gold setters and other gemologists who are all specialized craft-people skilled in the art of making truly one-of-a-kind jewellery, and timeless pieces of art that can be passed along for generations. And Cynthia got some of these beautiful pieces of jewellery and priceless knowledge on how best to wear such glam. Later that same week, MAC cosmetics called an gave Cynthia two traveling makeup kits, and complimentary make-up lessons on how best to utilize their beauty tools. During her month long life-changing competition, Cynthia may on some occasions have tend to her own hair and makeup, as there will be no professionals standing to by to work on her exclusively. And catching photographers’ eyes and making candidly perfect pictures is key to success in getting noticed by the Judges. In the mews underneath the venerated Royal York Hotel in Toronto, Cynthia Menard got fashion travel clothes by Helene Clarkson. Helene was there in person and gave the teen whatever she wanted. She selected a Kerry Tank Top in Navy, Zilina Reversible Blazer, Aro Cigarette Pants in Cement, and Orly Tank Top in Kale, and four other pieces of high quality designer clothing for travelers. Helene also gave Cynthia good advice on how to travel comfortably while maintaining her appearances. Helene shared lots of wisdom regarding selecting clothing for tropical climates. Designed for girls on the go, Helene Clarkson’s clothing offers a fashion-packed assortment of dresses, tops and pants for the urban traveler and fashionista inside every modern woman. Fabrics that resist wrinkling combined with multi purpose designs that flatter and travel well, makes for functional clothing that looks great, wears great, and feels great. Fashion photographer Erwyn Loewen, an artist who worked with legendary fashion photographer David Ritchie as his Photographer’s Assistant for several years, had a lot of information to pass along to Cynthia. Fashion photographer Erwyn Loewen spent time with Cynthia and passed on what he knows about modeling and projecting real confidence on camera. 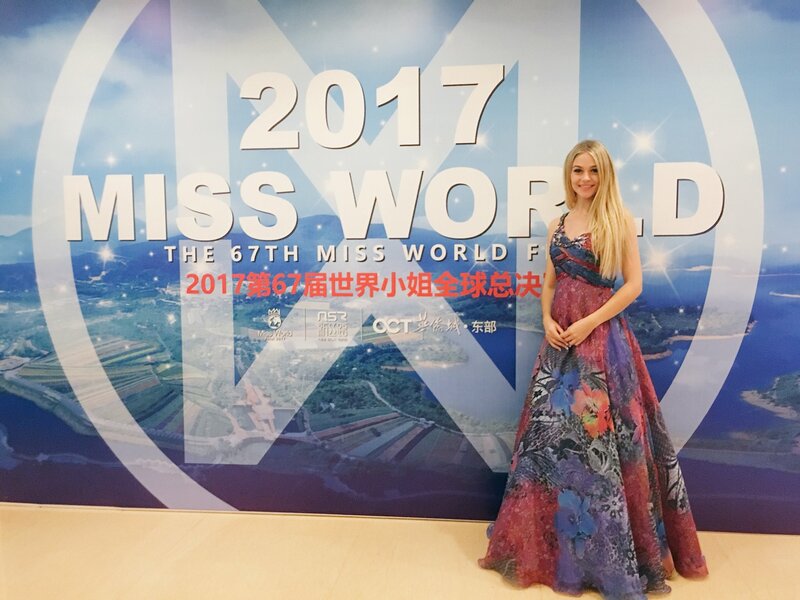 More of Erwyn’s pictures of Cynthia appear in eMagTO story about Cynthia Menard’s preparations for Miss World in Sanya China. Bells and Bows party dresses and evening gowns came from their headquarters in Lethbridge, Alberta. This bridal dress and prom dress shop has been a long standing supporter of the MTC-W enterprise, and Angeline MacDonald the proprietor is central to the Miss World Canada pageant judging committee. The Bells and Bows evening dresses and ball gowns are timeless and exquisite, and each piece donated to Cynthia is customized to showcase her beauty in combination with preordained pageant fashion accessories. This full-service boutique pays close attention to detail with an emphasis on communicating subtle cues and customs related to life in Canada. Readers, stay tuned for more updates on Cynthia’s journey and her 2017 Miss World Pageant experience.